In this post, we will talk about a couple of proverbs. They’re not quite from the English side but I think it’s still quite relevant to our life. 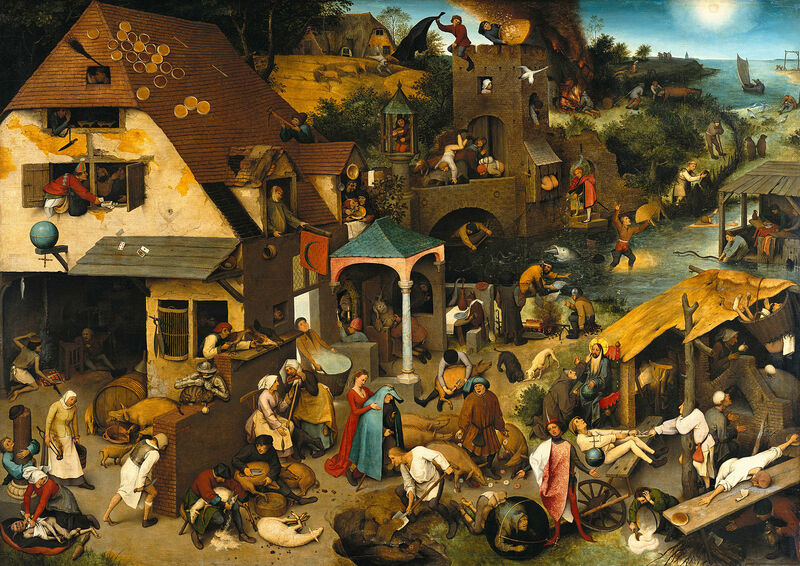 Pieter Bruegel is one of the most famous Renaissance Flemish painters (now Belgium) in the world. You might not know that at the time, there are so many proverbs created by the Dutch and Flemish. Here, in this particular painting, Bruegel literally painted all proverbs that existed at the time. These small figures characters presented the proverbs, sometimes you won’t notice that one scene could be different proverbs. Bruegel made quite a few paintings like this, such as one about children’s games which he basically painted all kinds of it. 1. To bang one’s head against a brick wall. Meaning: to try to achieve the impossible. 2. It depends on the fall of the cards. Meaning: it is up to chance. 3. To gaze at the stork. Meaning: to waste one’s time. 4. To wipe one’s backside on the door. Meaning: to treat something lightly. 5. To go around shouldering a burden. Meaning: to imagine that things are worse than they are. 6. To bell the cat. Meaning: to carry out a dangerous or impractical plan. 7. To put your armour on. Meaning: to be angry. 8. To throw one’s money into the water. Meaning: to waste one’s money. 9. To be barely able to reach from one loaf to another. Meaning: to have difficulty living within budget. 10. She puts the blue cloak on her husband. Meaning: she deceives him. My name is Marc, an English Teacher from Canada but currently working and living in the eternal city of Rome. If you are interested in learning English the easy way, subscribe to my channel http://www.youtube.com/user/englishmarcnet and LIKE me also on FB http://www.facebook.com/englishmarcnet.